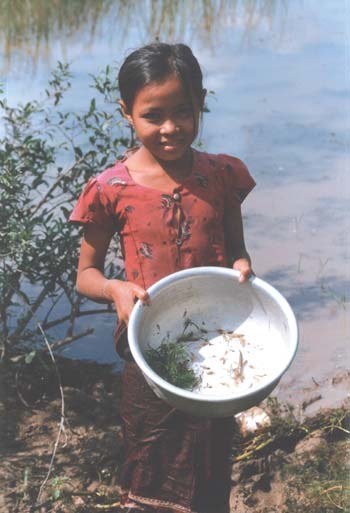 Results of the study demonstrate the importance of aquatic resources in the health and nutritional status of rural people in lowland areas of Attapeu Province, Lao PDR. The general status of local livelihoods is quite poor and, in many cases, basic needs for food are not being met. Clinical signs of malnutrition were prevalent in all three communities in both men and women and at all ages. The health status of women and children was significantly worse than men. Local diets consist mainly of rice, supplemented with insufficient amounts of animal proteins, and almost no fats. The typical diet in many households is insufficient in both quality and quantity, leading to low productivity and a marginal livelihood. Traditional eating habits and lack of appropriate information are at least partially responsible. Aquatic resources make up most of the animal protein consumed in terms of frequency and quantity. This is significant given that the over-all diet is protein-deficient. Rice and cheaper (bulkier) food items are given priority over protein in local diets. Rice is consumed more frequently and in higher quantities than other types of food, providing most of the calories consumed. 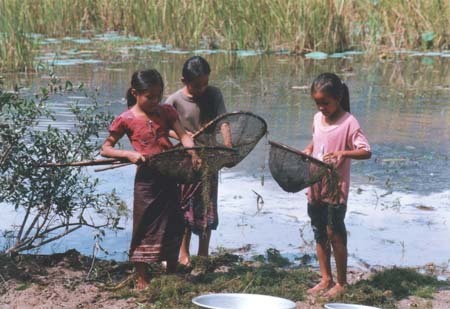 Time and resources devoted to acquiring aquatic resources are a substantial part of livelihood strategies. This includes both fishing and foraging activities, making and maintaining gear and processing fish products. Aquatic resources are a key part of the coping strategy for periods of rice shortage. Aquatic organisms are often sold and bartered, especially the larger, more valuable organisms and especially when rice is in deficit. Few coping strategies exist for shortages of aquatic resources. Given their importance in the diet, any shortages will have major impacts on peoples well-being. Local practices lead to poor nutrition during pregnancy and lactation, leading to poorly nourished children. This has an impact on the rest of the childs life. Food security and poverty alleviation strategies must include aquatic resources management. Community and household factors that affect food behaviour have a huge impact on peoples health and nutritional status. Aquatic resources management needs to include elements of education and public health. Knowledge about food and nutrition may have been a more useful criterion for determining dietary intake than economically-based characteristics. Community location did not turn out to be a good predictor of nutritional status among adults or children. The remote community of Tamoyot showed the lowest rate of adult malnutrition with child malnutrition rates that were midway between the non-remote communities. Developing effective management interventions for isolated parts of such a complex system is likely to have negative impacts on other parts. 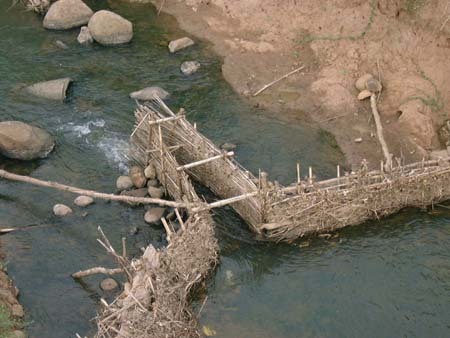 Livelihoods of rural people in the lowlands of Attapeu and aquatic resources cannot be easily separated. Of the animal protein sources consumed in rural households, aquatic resources contribute more to local diets than domestic animals or animals hunted in the forest and are used to compensate for shortages of rice. Households that routinely suffer from food insecurity in the form of insufficient rice often depend on wild aquatic resources to compensate for this deficiency. A rich diversity of fish, crustaceans, molluscs, amphibians, reptiles and plants from a range of water bodies play a central role in traditional livelihoods. Though many of these resources are seen to be declining, they are still important. Both aquatic resources and rice are fundamental in meeting objectives of promoting poverty alleviation through improved health and nutrition, enhancing food security, and increasing productivity. The link between rice production and aquatic resources is inescapable. Because many aquatic resources are seasonal, cyclical and are common property resources, sustainable management will require an integrated approach. Developing effective management interventions for isolated parts of such a complex system are likely to have negative impacts on other parts. Interactions and connections need to be identified and addressed in management strategies that also address the need to maintain the health of the ecosystem. Developing an understanding of connectivity between resources will be crucial to sustainable management. There is huge potential for promoting sustainable livelihoods in the lowland areas of Attapeu Province. Family and village social structure is intact and arable land and natural resources are still relatively abundant. Livelihoods are diversified and adapted to seasonal and environmental changes. Enhancing such diversity will minimize risks, reduce vulnerability and reduce dependence on non-cultured resources. It is important to promote livelihood strategies that include elements of accessibility, diversity and stability, rather than emphasizing rice production potential alone. Peoples participation is a key component of sustainable management of aquatic resources and sustainable development. Because livelihoods in Attapeu are so closely linked to natural resources, local people are the most logical entry point into sustainable management. Because of their daily interaction with these resources, they know the status better than most outsiders and can provide a valuable mechanism for long-term management. This level of participation is only possible when local people have an active role in management. However, people will only be able to consider the long-term perspective required for sustainable management when their immediate needs for health and well-being are met. The lack of food security is one of the major constraints to enhancing peoples livelihoods in the villages studied. People who have poor diets typically suffer from ill health and are unable to contribute to local development. Many households do not have enough rice to last throughout the year and are constantly coping with shortages. These households are often highly dependent upon natural resources to overcome their rice deficits. Current provincial plans to increase rice production and eradicate poverty may not adequately serve this group and may even increase their vulnerability by reducing the resources upon which they depend. Any improvements in the health and nutrition status of rural people in Attapeu will have wide reaching impacts and make a significant contribution to poverty alleviation. Cross-sectoral interventions to address the interconnected issues of health and nutrition should emphasize nutritional quality and food behaviour aspects of food security. Health interventions, including awareness-raising, that cover nutritional issues for women and children will also have great impact.